For 2008, Bob created this design to celebrate the fragile beauty of our home planet. 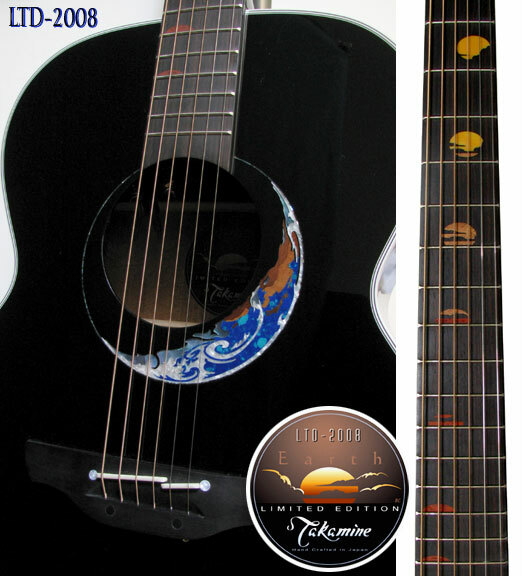 The LTD-2008 is the first LTD guitar to use the Takamine non-cutaway NEX body. The striking rosette illustrates a 'crescent' Earth aloft in space, framed by a beautiful gloss black finish. Bob's original artwork was inspired by several NASA photos of Earth. It depicts the appearance of sunrise across Japan and the Pacific Rim (where the guitar was built). The fingerboard inlays animate our view of sunrise from Earth's surface. Inlay materials were chosen to make the rising Sun change in tone as it passes through the dense horizon air and silhouetted clouds. The rosette materials include azurite stone for the ocean blues, jacaranda, koa and imbuia woods for the land forms. Abalone and faux mother-of-pearl make the swirling cloud patterns. Even the boundary between daylight and night seems to fade by the selection of different colored materials. This gives a dramatic 3-dimensional effect to the design.